Ricinus, or Castor Bean, is a fast growing vining plant with large veined leaves. This plant prefers full sun and make for a perfect privacy screen! Ricinus seeds are poisonous. 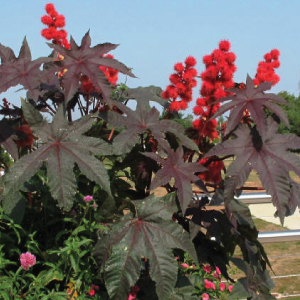 The Gibsonii Ricinus, or also known as the Castor Bean, produces large, dark green leaves with red stems, beautiful pink flowers and red fruit.